Ricardo Teixeira, a man for whom the expression ‘it’s not what you know, it’s who you know’, could have been coined, has resigned as head of the Brazilian Football Federation and the 2014 World Cup organising committee on health grounds. Teixeira, a man of no discernible merit, took the short cut to career advancement by marrying the daughter of Joao Havelange, former president of FIFA; from there it was just a hop, skip and a jump to becoming the most powerful man in Brazilian football. Teixeira has been under growing pressure amid concerns about Brazil’s practical ability to host the World Cup in two years time. Moreover, there has been the persistent drip, drip, drip of allegations concerning corruption, including the imminent publication of a settlement related to alleged bribes paid to senior FIFA officials in the late 1990s by the marketing company ISL. It’s unlikely that news of his departure will prompt any outpourings of grief among the Brazilian public. Romario may have spoken too soon. Teixeira is succeeded by José Maria Marin, 79, a former politician. Anyone expecting a new broom appears destined to be disappointed. Schalke 04’s former Spanish international striker Raul has donated his shirt and the football with which he scored his 400th professional goal to the future museum of German football. There was a time, towards the end of his career in Spain, when many Madrid fans would have gladly seen the fading striker take up permanent residence in a museum, but the move to Germany appears to have renewed his appetite for the game and revived his attacking instincts. Raul’s landmark goal came on February 19 in a 4-0 win over Wolfsburg. “I’m experiencing wonderful times in the Bundesliga and I’m very proud of the affection shown to me by the German fans,” said Raul, who moved to Schalke in 2010. “It’s obviously a wonderful gesture to German football as a whole,” said Manuel Neukirchner, director of the museum which opens in 2014. The 34-year-old scored 323 goals for Real Madrid, 44 with the Spanish national team and 33 with Schalke. He is the highest scorer in all UEFA competitions, with 73 goals. Corinthians have discovered what the rest of the football world suspected several years ago: Adriano is no longer interested in being a professional footballer. As a result the club have released the Brazil striker. “Corinthians did everything to help Adriano,” sporting director Roberto de Andrade told Radio Globo. The club did its bit but Adriano didn’t exactly help himself. Overweight and looking unfit on the pitch, he angered the club’s officials on Friday, when he refused to weigh himself after training. The final straw came two days later as the striker asked for permission to miss Sunday’s training session. Liverpool manager Kenny Dalglish has set about defining what constitues a successful season. It would seem a relatively straightforward task: tot up the number of points at the end of the season, see what position you have finished in the league and you’d have a fairly good idea if your team had enjoyed a successful campaign or not. Or so you’d think. Dalglish, though, has set about redrawing the parameters of success and believes that the traditional definition is now too narrow. “The club is now where it was before – each one for each one, everybody in it together,” he said. “There are many ways you can judge a season and the best way is progress at the football club as a whole. I don’t think it necessarily relates to trophies or points. So, there you have it Liverpool fans: Manchester United may be on course to win their 20th league title, but they’d give it all up in a heartbeat in exchange for a better kit deal. PSV Eindhoven have appointed Philip Cocu as coach until the end of the season after sacking Fred Rutten. Rutten was sacked following three successive heavy defeats which have threatened to end the club’s hopes of silverware for the season. Sunday’s 3-1 defeat at lowly NAC Breda followed a 6-2 home defeat against title rivals FC Twente. Sandwiched in between those league games was a 4-2 defeat at Valencia left PSV in the Europa League. Rutten was popular with the players, but PSV Eindhoven managing director Tiny Sanders was keen for a change of direction at the helm. “That Rutten enjoyed the support of the majority of the players did not matter to the board,” he said at a press conference on Monday afternoon. “If players support the coach that does not automatically mean that he should remain. Kris Boyd, the record goalscorer in the history of the Scottish Premier league, made his mark on his MLS debut for Portland Timbers last night. A powerful flicked header from the Scot gave the keeper no chance and set the Timbers on their way to a 3-1 win over Philadelphia Union. No end to his talents? Lionel Messi took a spell in training on Monday and showed that he’s no slouch between the sticks. Barcelona skipper Carles Puyol snapped the forward making a full length save and posted the image on his Facebook page. 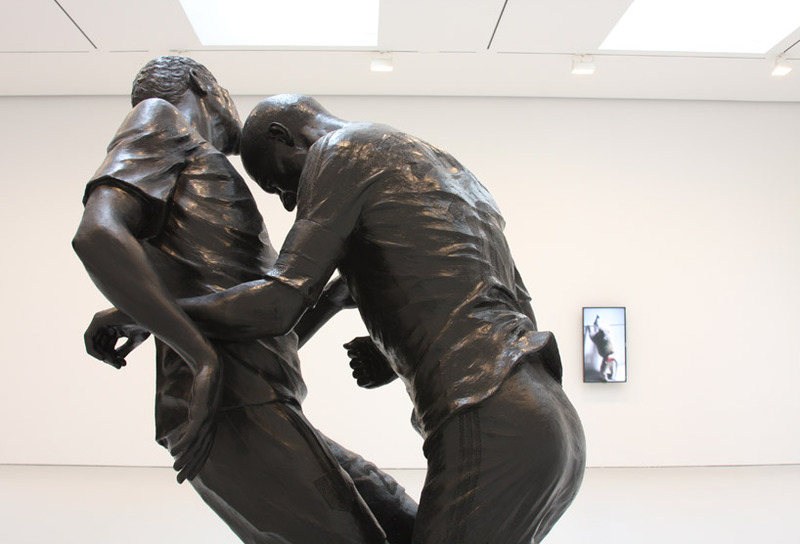 The David Zwirner Gallery in New York has an exhibition on at the moment called ‘Who’s afraid of the big bad wolf?‘ and among the exhibits is a sculpture ‘celebrating’ the infamous moment in the 2006 World Cup final when Zinedine Zidane’s head butted Italy’s Marco Matterazzi. The sculptor, Adel Abdessemed, is from Alergia where Zidane’s family originate, which might explain the choice of subject matter. The sculpture, titled ‘coup de tête‘, speaks according to one review, to the themes of violence, aggression and spectatorship present throughout the exhibition. Additional shots of the sculpture can be found here. FIFA has stated its “satisfaction” after Amadou Diakite and Ahongalu Fusimalohi became the latest former Executive Committee members to lose their appeals against bans for corrupt behaviour during the bidding process for the 2018 and 2022 World Cups. The Court of Arbitration for Sport (CAS) confirmed that it had upheld the two-year bans ratified by FIFA’s Appeals Committee, and said it would publish more details on the cases this week. The case stems from a Sunday Times sting operation during which the pair explained how to bribe FIFA officials with $1 million. The CAS rulings against Diakite and Fusimalohi came after the Court last month upheld Amos Adamu’s three-year ban from football for his part in the scandal. Adamu was secretly filmed asking for $800,000 to influence his vote. Former Asian football chief, Mohamed bin Hammam, whose appeal against his lifetime ban from football will be heard by CAS next month, must be wondering if it’s worth the trouble. Former German international Timo Konietzka, who scored the first ever goal in the Bundesliga, has died at the age of 73. In an obituary published by Blick on Tuesday, Konietzka thanked the Swiss assisted suicide group Exit for helping him end his life. Konietzka was playing for Borussia Dortmund when he scored the first Bundesliga goal in the first minute of a match against Werder Bremen on August 24, 1963. He won the Bundesliga with Dortmund that year and again three years later with 1860 Munchen. Konietzka moved to Switzerland in 1967, and as a coach he won four Swiss championships and guided FC Zürich into the European Champion Clubs’ Cup semi-final in 1977. After retiring from the game he ran a hotel on Lake Lucerne with his wife.